Take Exit 15 (Route 7, North) to Exit 3 (Merritt Parkway, CT Route 15 South toward NYC) and follow the directions below. Take Exit 36 (Route 106/Old Stamford Road, New Canaan/Stamford). At traffic light at the end of ramp, turn left onto Route 106/Old Stamford Road. At the light, turn left onto Jelliff Mill Rd. Take Jelliff Mill Road one mile to the end and stop sign. Turn right onto Ponus Ridge. Continue .8 mile to stop sign. Turn right onto Frogtown Road. The school entrance is on your immediate left at the corner of Ponus Ridge and Frogtown Road. Take CT-35 west from Ridgefield Center to NY-123 intersection, and turn left onto NY-123 south/Smith Ridge Road south. Follow NY-123 south/Smith Ridge Road into New Canaan to Route 106/East Avenue intersection, and turn right onto Route 106/East Ave. Follow East Avenue to Main Street. Turn left onto Main Street and then a quick right onto Elm Street. Take Elm Street .7 miles through the town of New Canaan to the end and stop sign. You will pass the New Canaan train station on your left. At the stop sign, turn left onto Weed Street, and go about 500 feet to stop sign. Turn right onto Frogtown Road. Take Frogtown Road 1.5 miles to entrance of school on the right side. Come explore our 75-acre campus. INDIVIDUAL TOURS are offered daily by appointment. Please call (203) 801-5608 or email admissioninfo@countryschool.net. For admission inquiries, please visit the Admission section of our website or email admissioninfo@countryschool.net. For information about alumni, please visit the Alumni section of the website or email alumni@countryschool.net. For information about giving, please visit the Support section of the website or email tgumz@countryschool.net. 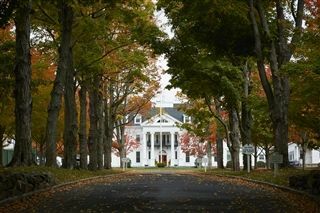 For information about employment at New Canaan Country School, please visit the Employment section of our website.